Recorded Live at Aichken Taiikukan, Nagoya, Japan - March 03, 1976. Excellent Audience Recording :: Silver CD/s :: CBR 320 kbps & FLAC. Files: 22. :: Size: 225.95 MB (mp3) / 735 MB (flac). 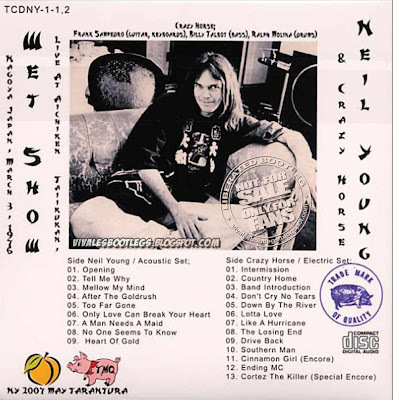 Personnel: Neil Young - vocals, acoustic guitar, electric guitar, keyboards, guitjo, harmonica :: Frank Sampedro - guitar, keyboards, vocals :: Billy Talbot - bass, vocals :: Ralph Molina - drums, vocals. Notes: This was Young’s first visit to Japan and he played seven shows in Nagoya, Osaka, Fukuoka, and Tokyo. All of the shows have been taped and many pressed. The most recent releases include Another Osaka (Screamer), which contains half of the March 4th show, and GFK (Watch Tower) containing the Fukuoka tape. Wet Show, one of two recent Neil Young releases on the Tarantura label, contains a brand new complete audience recording. An older excellent audience recording exists and was released several years ago on You Are Just A Dream (F*!#in’ Up FUPCD-2001/2002), but is missing the second encore “Cortez The Killer.” Wet Show legitimately has the second encore and for the first time this show is complete. The sound quality is simply stunning. It is a three dimensional stereo audience recording taped right in front of the stage. The balance between the instruments and audience is perfect, and is detailed enough to pick up Young’s off-mic comments.<-(Info taken from collectorsmusicreviews.com). ::::: This recording of the first show of 1976 Japanese Tour is from a previously uncirculated master and contains a previously uncirculated second encore of Cortez The Killer. This is a recent release from the apparently exclusive Tarantura label and is supposed to be direct from the original cassette masters. The sound is stellar.<-(Info taken from original info file). I was there! It was a great concert. And after waiting for him to come out from the backstage at the parking lot, yes, he walked out from the backstage door, and I could meet him and he shook my hand! I still have the ticket(which has a nice graphics). This sounds far much better than the previous boot which I already own. I looove those 1976 Neil Young and Crazy Horse shows. And this is nothing less than described. Gotta go. Disc one just ended! Thanks a lot for this one. 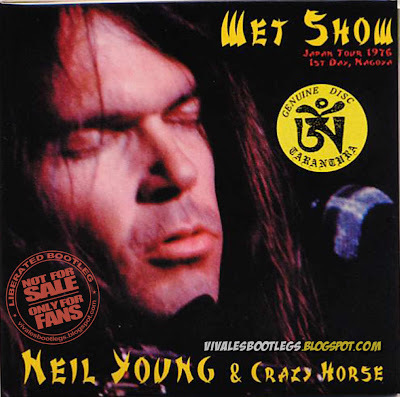 Neil Young & Crazy Horse were at their very best in 1976 - great concerts in Japan, Europe and USA. I have this show already, but this edition is a great upgrade in sound quality. Thanks man, This guy's a blast.